A moist or wet basement is a problem that can quickly develop into a complete disaster. A periodic inspection of the basement can very often provide accurate indications of a water problem somewhere else in your home and can help prevent a much bigger damage. Moisture in the walls are a red flag for a water problem in the basement. 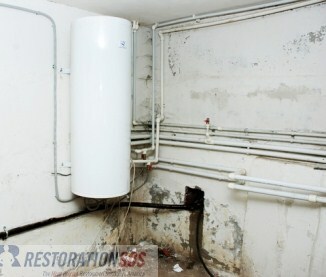 Moist walls may be a warning sign for internal plumbing leaks or cracks in the foundation. Take a look at the walls and search for water stains. If visible, follow the water trails to locate the source of the problem and fix it immediately. Even at the smallest sign of a leak in the basement, it must be treated promptly. Make sure there are no leaks or signs of moisture and ensure that these penetrations are well-sealed. A common problem is pipe condensation caused by pipes sweating. This problem promotes mold, corrosion and rotting if ignored. To reduce condensation, consider insulating all pipes. Dryer vents, exterior electrical outlets, and phone and cable connections often go through the basement walls. If not properly waterproofed, these openings will allow water intrusion to the basement. Foundations, even when built with the best water defense, are not always waterproof. The house can shift and settle over time, forming gaps and cracks. The exterior landscape also changes over time, which can lead to excessive water in the soil around the foundation. Be aware of these facts, especially if you cannot find the source of moisture in your basement. Consult a professional if you need to make any landscape changes or foundation repairs. This article completes the damage prevention guide for the basement, providing tools for inspecting heating, ventilating, and cooling systems and sump pumps. Keep your basement cool and dry to prevent cockroaches, mice, snakes etc.